I hope everyone had a blessed Thanksgiving. I know I am a little late in posting this week, and I was going to say it was all because tomorrow is Giving Tuesday and I really wanted this blog post to be fresh in your minds, but truthfully I got sidetracked while visiting with family. Now, though, we are home and it’s time to get back to the business of giving! This week I want to bring your attention to a sweet boy named Ryland–the smiling little man you see in this post’s featured picture. 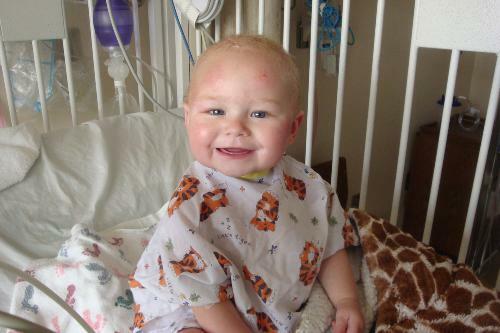 Ryland has spent most of his fifteen months of life in the hospital fighting to survive. His story not only touches me on a personal level because he is the great-nephew of a dear friend, but also because I can relate to the struggle he and his family face. You see, my own little girl was born with birth defects that kept her in and out of hospitals for many years, and on three different occasions, she almost lost her life. Any parent of a critically ill child will tell you that the fight for their child’s life is the most stressful, fearful, torturous, exhausting event they’ve ever experienced–and yes, even having been through some pretty tough experiences in the military, I can say that NOTHING ever came close to the pure physical, emotional, and mental toll my daughter’s illness took on me…and I’m sure my husband would attest to the same. Daily life in the hospital is like a roller coaster–one minute things are looking up and you begin to see light, the next minute another complication arises and you are plummeted back into darkness. With all the ups, downs and turn arounds, I often think of our time in the Neonatal Intensive Care and Pediatric Intensive Care Units with our daughter as the closest I could come to being bipolar without actually have the disorder. The only thing that kept us going was our faith in God, along with the support, prayers and well wishes of so many family, friends and even complete strangers. It was beyond comforting to know that there were people around the world praying with us and pulling for our daughter. So this week, that’s what I want for Ryland and his family. I want everyone who reads this to gather in prayer for this sweet little boy and his parents. Pray for his healing. Pray for comfort. Pray for his doctors, that they may be lead to accurately diagnose and treat whatever condition ails this darling child. Pray. Pray. Pray. I know God will work a miracle, I’ve seen it happen before. And if you don’t believe in God or prayer, then please just send good thoughts to this family. Visit his blog: http://www.caringbridge.org/visit/rylandanderson Sign the guestbook and send a message to Ryland’s family letting them know that you are with them in hope and prayer. It may not seem like much to you, but I know it would mean the world to them. If you are moved to do more for Ryland and his family, consider donating any amount to help offset the cost of his ongoing care. There is a fund set up for him at the Spokane Teacher’s Credit Union (509-326-1954) under the name Ryland Anderson , #278005. Another way to support Ryland is through a fundraising silent auction this Saturday, December 1, from 1:00-3:30pm at the Garland Church in Spokane, Washington. You can find more information about this event on Facebook. Just click here. Thank you so much again to everyone! Next week I will be sharing stories of people I know who are going above and beyond this holiday season…and of course there will be another assignment, so stay tuned and Happy Giving! Beautifully expressed, Kirsten as one who’s “been there” and can feel deep empathy for another family walking the path for their child. Thank you from the bottom of my heart – and, from my family’s heart too. You are a gift of love. Blessings to you and your family. Praying with all my strength for a miracle! I will but do I have to fold my hands! inspiring message. YES…lots of prayers will be sent up for Little Ryland from the Dugall’s. We know first-hand how a critical illness in a child ROCKS YOUR WORLD as a believer as a family member and in all mental, emotional & physical ways! The Lord blessed us with complete healing in our Abby after two and a half years of treatment for Leukemia staring age 3 yrs old! We will pray fervently for Little Ryland and hid family! Thank you Vicky! I know it means a lot to Ryland and his family!